An airport is a busy place. Atlanta's Hartsfield-Jackson International Airport had 104 million passengers pass through its doors in 2016. That means more than a quarter-million people move through the airport every day. They sit in the chairs, touch bins at security, grab straws, and put straws back when they accidentally grab two. Insurancequotes.com sent teams to swab six surfaces at three major US airports and on three flights to take a look at the average number of colony-forming units (viable bacteria and fungal cells per square inch) living on various surfaces. The sample isn't huge, so there are questions about how close the numbers are to a true average. You probably don't need to scrub your entire body with pumice and disinfectant. But it does give a sense of what is happening at some airports and what may be happening at others. Of course, armrests at the gate and the button on water fountains rank highly. Those are places that get touched frequently and probably aren't cleaned as often as is necessary. 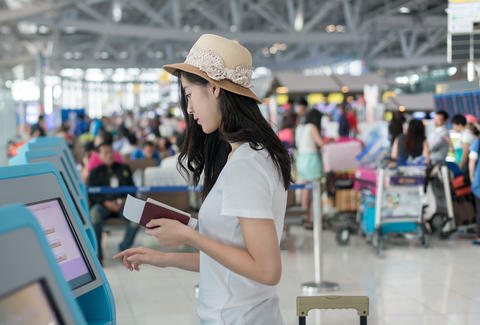 However, the self-check-in kiosks were the germiest places the team tested with an average of 253,857 CFU. That's a lot. However, one was recorded as having more than a million CFU. That probably says that there's the potential for the check-in screen to be super filthy. But that one certainly pulls the average up, which shows how a larger sample size would help get a more accurate sense of how dirty the tested areas are on average. Inside the airplane, the team found that the flush button in the loo contained the most grossness. That probably doesn't surprise anyone. Get more details about the kinds of bacteria found and the team's methodology here. However, with this year's flu season being worse than normal, maybe just wash your hands a little extra at the airport. Even if the sample here is small, it couldn't hurt to get an extra wash in. You've seen weird things happen at the airport. Imagine everything you haven't seen.